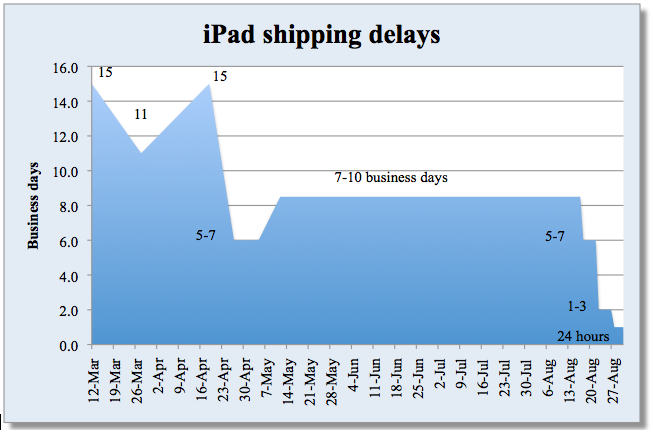 Online iPad shoppers used to be forced to wait up to a week for their tablet orders to ship. 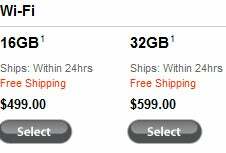 But now orders ship within 24 hours as Apple has apparently solved a nagging iPad supply problem. According to Apple's online store all six versions of Apple's iPad ship in just 24 hours from the time of purchase -- down from up to seven days in recent weeks. Since it first launched the iPad in April, Apple managed to sell more than 3.27 million tablets, according to figures from late July. Now, after months of delays and estimated delivery times as much as three weeks at peak times, Apple's official online store displays a delivery schedule of just 24 hours. Apple basically ran out of iPads the week it launched the tablet in the U.S.. The company said it has sold 500,000 units during launch week, and had more than 200,000 pre-orders for the WiFi-only iPad before the tablet even went on sale.